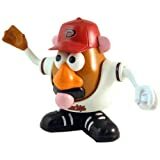 Arizona Diamondbacks Mr Potato Head This fun toy can now be dressed up to be a fan or mascot of your favorite team! Comes complete with mutliple pieces to change his look regularly. A great fan item – a great collectible! Clamshell packaged. This entry was posted on February 27, 2012 at 3:52 am and is filed under Arizona Diamondbacks. You can follow any responses to this entry through the RSS 2.0 feed.